A restaurant is one of the most exciting, challenging business ventures to embark upon. Unfortunately, it’s also an accepted truism that many aspiring restaurant owners close their doors before they are able to find their clientele. With so much at stake, helping your restaurant flourish depends on effectively reaching new customers who will appreciate the unique cuisine you bring to the table. Here are five methods you can use to help hungry patrons learn about your restaurant. Often, restaurant owners who do not depend on delivery and takeout as a major part of their business discount the importance of creating a professional website. This does their restaurants a disservice by failing to consider customers who would find them online. If you’re depending on foot traffic to get patrons in the door, you are missing out on a significant number of customers. Instagram is king when it comes to promoting mouth-watering food photos, and users with a wide reach on the platform have the potential to bring in a large number of customers. To harness the potential of influencers, do a little research about Instagrammers and food bloggers who are active in your area, and contact them about featuring your restaurant. Most social media influencers are happy to review local restaurants, so don’t ignore this potential traffic channel. You probably already have a Facebook, Instagram, Pinterest, or Twitter account, but it takes more than sporadically posting pictures of food you’ve prepared to drive online engagement. Instead, think of social media as a tool you can use as part of an overall marketing strategy. For instance, give followers a reason to keep tabs on your restaurant by holding special events and contests and promoting them using Facebook events. 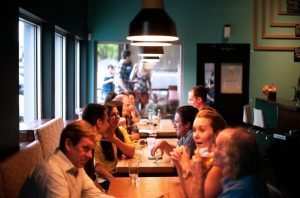 Pub quizzes, wine tastings, and sports viewing parties are just a few examples of events that will get social media subscribers excited about going your restaurant—and bringing their friends. Email marketing often isn’t the first thing that leaps to mind when it comes to promoting a restaurant, but maintaining a robust email list can help you build your customer base. Offer subscribers exclusive discounts, access to tasting events and other attractions, information about changes to the menu, and even the chance to vote on new items. This will make them feel like they have a stake in your success. Keeping track of email subscribers will also give you a good idea of how many regular patrons you have, and how you can grow your restaurant sustainably. With many restaurant goers turning to review sites like Yelp for recommendations about where to eat, restaurant owners must take proactive steps to ensure they have a positive online reputation. Unfortunately, there’s not much you can do about a bad Yelp review, but ensuring that you consistently provide great food and service should keep your ratings high. A digital marketing professional can help you develop strategies for online reputation management if you are unsure of how to get started.